The updated second edition of this text introduces readers to the business of film at every stage of the filmmaking lifecycle, from planning and production to distribution. Authors Paula Landry and Stephen R. Greenwald offer a practical, hands-on guide to the business aspects of this evolving industry, exploring development, financing, regional/global/online distribution, business models, exhibition, multi-platform delivery, marketing, film festivals, production incentives, VR/AR, accounting, and more. The book is illustrated throughout with sample financing scenarios and charts/graphics, and includes detailed case studies from projects of different budgets and markets. This new and expanded edition has further been updated to reflect the contemporary media landscape, including analysis on major new players and platforms like Netflix, Amazon, Google and Vimeo, shifting trends due to convergence and disruption from new technology, as well as the rise of independent distribution and emergent mobile and online formats. An eResource also includes downloadable forms and templates, PowerPoint slides, quizzes and test banks, and other additional resources. Paula Landry is a writer/producer, film business and media consultant, interested in disruptive business models. Landry crafts feature films and episodic content, business plans, budgets and schedules, as well as branded content for Fortune 500 companies and non-profits. Landry is president of IdeaBlizzard Productions and is also the author of Scheduling and Budgeting Your Film: A Panic-Free Guide, now in its second edition. An active member of NYWIFT, Landry conducts media seminars worldwide, coaching creative entrepreneurs and teaching MBA students in various colleges in New York City. Stephen R. Greenwald has served as an executive, financier, consultant, and lawyer within the motion-picture industry. He is currently the managing partner of G&H Media LLC, Chief Operating Officer of Grey Eagle Films LLC and Director of Media Studies at Wagner College in New York. Stephen has worked widely in the movie business, and from 1999 to 2007 was president of the Metropolitan College of New York, where he launched an innovative graduate business program in media management, the first of its kind in the country. "Behind the mystique, red carpets and dreams of glitz and glamour lies a business like no other. If this is a business you’re in or headed toward, you need to understand how it started, how it works and where it’s going – whether you’re a student or a producer prepping your first film. The knowledge in this book is gold, and it will expertly guide you over the steep learning curve that, for some, takes years to navigate. Buy it! Read it! It’ll make you a whole lot smarter, save you time and money and help to propel your career." "The Business of Film by Paula Landry and Stephen Greenwald is the only book I have found that details not only how to work within the studio system to develop, finance, produce, market and distribute a film, but also how to go the independent route. It is the most comprehensive, step-by-step resource for anyone interested in the film business and as such is the essential text in my Film Business course." 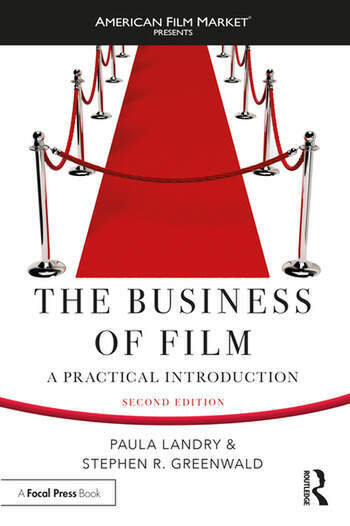 "Paula Landry and Stephen Greenwald’s book The Business of Film is a fantastic introduction to the film business for someone coming to it fresh. It will be of particular use to those looking to understand the unique and often opaque world of feature film accounting. In addition, the legal templates and contracts provided will be an invaluable resource to up-and-coming producers."